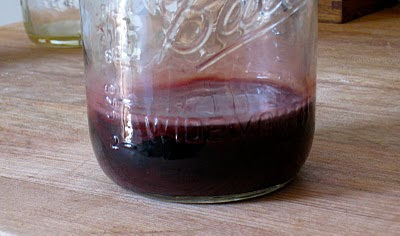 I thought all my homemade blackberry wine was gone until I started ransacking my pantry when I was getting ready to move. (Oh, has it been that long? Yes, I moved up the hill a ways to a place with a vast backyard and a chillier ocean breeze.) 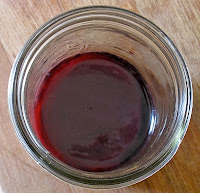 One of the first things I did in the new kitchen was to turn the blackberry wine into a vinegar project. I have seen vinegar mothers for sale at high prices, but I figured that alcohol exposed to the air would become vinegar just fine by itself. So I just put it in a wide-mouth pint jar, covered it with cheesecloth, and left it in the cupboard. I really wouldn't feel at ease in a new kitchen if there weren't a magical transformation occurring in at least one of my cupboards. After things were mostly unpacked, I took the next train to Oregon for a long-awaited visit with my brother's family. We had afternoon tea parties and evening rounds of zombie ball, and Legos and stories in all the between times. Then I got on the train again and sobbed my way back to San Francisco. Did you know that in Oregon there are thunderstorms and bare feet? W. Crawford was away at work, so I went right to my cupboard for comfort when I got back to our apartment (no, not to the snack cupboard, because I don't even have one, but to the Cupboard of Magical Things). I took down my vinegar experiment, and one whiff convinced me it was a success. 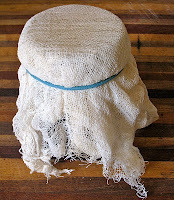 But then I undid the cheesecloth, and there was the most gratifying skin growing over the top of the liquid! Vinegar I had expected, but a glorious filmy mother-of-vinegar? I had assumed that if vinegar mothers cost twenty dollars, they must not form easily. I should have known. Homemade things are almost always easier and more delicious than businesses want you to think. Now here's the question. When a delicious, vigorous homemade blackberry wine becomes homemade blackberry vinegar, how delicious will it be? I have been pondering this question quite patiently, fueling my imagination with whiffs from the vinegar-jar, hypothesizing about the effect of blackberry vinaigrette over x, and blackberry vinegar reductions on y, and I just don't know. I want to wait until the vinegar is as strong as can be. I think the mother should be at least an eighth of an inch thick before I even dip my finger in the jar. And yes, that's another Paprikahead recipe: put something in a jar and leave it in your cupboard for a while. On an entirely unrelated note, I had a delicious dream last night about roasting a chicken and some scallops. Wouldn't roast scallops be good? I imagine I'd have to roast them at a very high heat--nearly broil them, but just for a minute. I wonder if I could persuade my friend with a wood-fired pizza oven to try it. My flask of plain old apple cider vinegar is home to one giant mother. She and I aren't always on the best of speaking terms, I'll admit. She gets in the way, and bits and pieces of her are inclined to wiggle into places I don't want them to go. You should go into business! There's a market for mothers-of-vinegar. I also make vinegar and love the resulting smells - it is so homey and the results are always so great in salads, etc. I've heard that a remedy for bad smells in a house are to set out little open dishes of vinegar here and there, so you brewers have that extra advantage...assuming of course that one also likes the smell of vinegar. OH you rock! Save this one for a sequel? So were you thinking of the vinegar to glaze the chicken too? I think it would be great.